Please download and fill out the following form, in order for us to be able to prepare your tax return of 2016. We invite you to fill it out electronically and to return it to us via email (admin@lmkca.com). You can also scan and send us the documents listed in the form or send them to us via mail. 2017 Ranking & Reviews. Top Ranking Accounting Firms in Montreal, Quebec, Canada. As a resident individual, local business, or governmental body, finding the right accountant in Montreal is increasingly important. You need someone with experience that goes beyond simply preparing Balance Sheets and P&L Statements. Today, the environment of multi-tiered government laws, tax regimens, and other regulatory frameworks is so complex that “going at it alone” or working with “just any” CPA in Montreal isn’t an option. In many instances, doing so could be detrimental to you. Because of these concerns, AdvisoryHQ has used its signature methodology to scan and assess a number of accounting firms in and around Montreal. The objective of producing this review of the Top Accounting Firms in Montreal is to help individuals and businesses evaluate some of the leading professional services firms in the area and decide whether they are a good fit for your specific accounting and business consulting needs. What Montreal accounting firms are proficient in Montreal tax legislation? What CPA in Quebec is the best in Montreal? What Montreal accountant has a specialization in forensic accounting? What accountant in the Montreal area offers a free consultation? SdM Chartered Professional Accountants, Inc.
BCGO Due diligence, Estate planning, Contract analysis, etc. Boily Handfield Retirement planning, Tax litigations, Debt financing, etc. Crowe BGK LLP Dispute resolution, Business valuation, Indirect tax, etc. Lacharité McComber Kuczynski Financial reporting, Succession planning, Process optimization, etc. MNP, LLP Regulatory compliance & reporting, Tax controversy, Technology risk, etc. PSB Boisjoli Cash flow forecasts, Compensation strategy, GST/PST/HST, etc. Raymond Chabot Grant Thornton LLP Business brokerage, Career transition, U.S. taxation, etc. RSW Business structuring, Sales strategy, Disability planning, etc. Sdm Chartered Professional Accountants, Inc. Managing tax audits, Customs & duties, Treaty interpretation, etc. 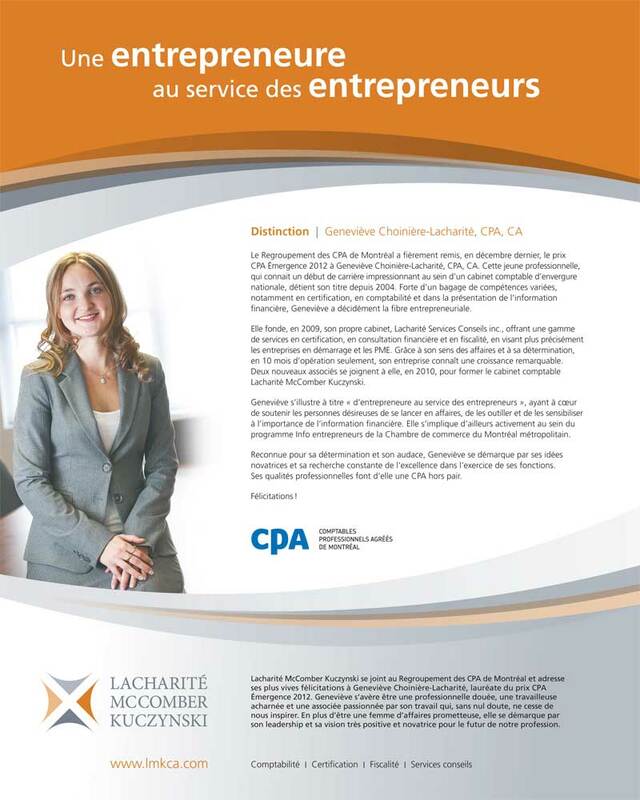 Lacharité McComber Kuczynski is a CPA of Quebec in the city of Montreal. They boast a team of experts whose knowledge covers Montreal tax, finance of Montreal, including auditing and advisory, as well as business advice. Lacharité McComber Kuczynski takes on associates with years of experience serving a diverse range of clients. The firm makes sure that each associate is well prepared for the demands of their clients by ensuring they fulfill several auditing mandates. The following were some of the significant reasons that enabled Lacharité McComber Kuczynski to be included in our list of top 10 accounting firms in Montreal. Lacharité makes a commitment to your organization when you become one of their clients. Lacharité McComber Kuczynski wants to build a strong working relationship that contributes to the success of your organization. The firm makes an effort to get to know the ins and outs of your business, ensuring the relevance of business advice they give to you as a client. They work with their clients to create long and short term goals in order to better understand the challenges and needs that you face as a client. Lacharité McComber Kuczynski has fostered many relationships with other affiliations over the years. This CPA of Montreal has benefited from the resources granted to them through these affiliations. Sage– A head of the financial software industry. Info Entrepreneurs– offers quality information on government programs and services, including finding financing in Montreal. 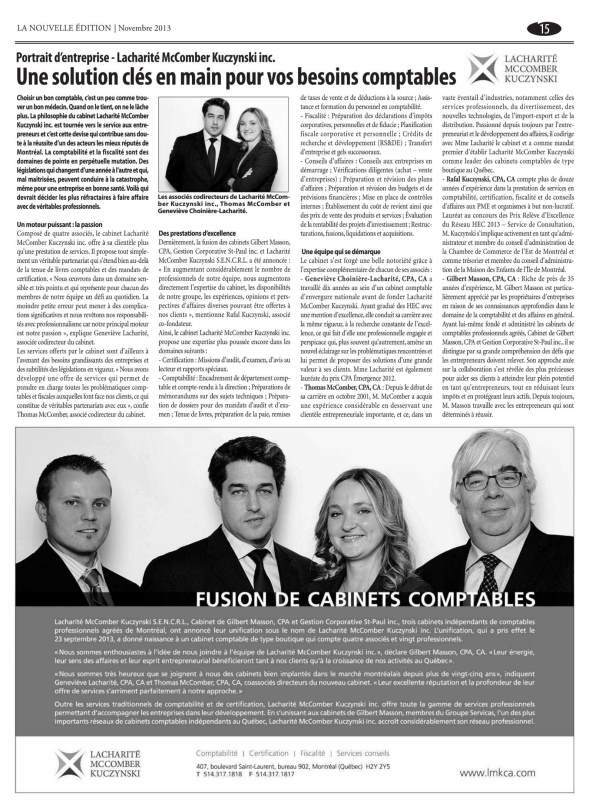 Servicas Group– network of advisors from CPAs in the Quebec area. One of the many services this Montreal CPA offers includes cloudkeeping. For Canadian business with annual revenues up to $5,000,000, Lacharité McComber Kuczynski offers online bookkeeping and advisory services. This service is extremely advantageous, offering increased efficiency, accessability and control without increasing costs. Lacharité offers knowledgeable bookkeepers to take on handling the numbers, while you can worry about focusing on other needs including growing your business. The cost of an outsourced bookkeeper is a fraction of that of an in-house bookkeeper. Lacharité will work to ease your business into the transition from in-house to outsourced. The transition will increase the security of crucial data as well as mitigating the risk of misappropriation of assets. The advent of technology has made the entire globe a competitive space, even for individuals and relatively small businesses. Those of us who are quick to adapt to changes in laws, advancements in best practices, and rapid development in processes and practices often end up with a competitive advantage over our peers. In these circumstances, having a top accountant or accounting firm on your side can set you on a path to success. All of the top 10 accounting firms in Montreal, who have been reviewed in this piece, have a lot to offer their clients. While they each bring unique skills and diverse sets of capabilities to the table, they all help clients in one common way: They take on the burden of helping you navigate the myriad of accounting, tax, and business consulting needs of your business or personal financial situation, leaving you time to focus on what’s important to you. In putting this review of the top 10 accounting firms in Montreal together, we have hoped to give you a head start in finding the right professional services firm to meet your specific needs. We believe that, regardless of what your specific circumstances are you are certain to find that one of 10 firms on this list is a perfect partner for you or your company. Is it the end of brown tights in accountancy? After an encouraging advertising campaign to this end towards the Members of Chartered Professional Accountants a few years ago, one of the major firm in Quebec, PwC, puts an end to its internal dress code. In July, the firm withdrew all clothing requirements for its employees. “We wanted to show that we listen to our employees and we trust them. Clothing is a way of expressing your diversity, showcasing your personality. We observed that casual dress Fridays were very well received, so we decided to make an innovative change in this conservative environment”, explains Nicolas Marcoux, National Managing Partner, Montreal office and major cities of PwC. PwC claims to be the first major firm of Quebec to take such a measure. However, in smaller firms, dressing habits are already flexible. “In our firm, style is more casual. Several male employees wear 3-day beards, as it is the current trend these days, blazers often stay on the back of the chair”, observes Thomas McComber, Partner in Lacharité McComber Kuczynski firm which employs 25 people whose average age is around 25 years old, excluding partners. Even if forty-year-old founders have thought to apply a dress code, they quickly gave up on the idea. “It would be difficult to enforce ties among younger people, not having a dress code has proven to be successful. Otherwise, it would negatively affect the people who enjoying the freedom of wearing what they want. When you remove the rule, you remove a thorn at the same time and people take greater responsibility” continues Thomas McComber who observes that the dress code of his employees remains very conventional. The actual rule in the Lacharité McComber Kuczynski firm is adaptation. Because, in today’s modern age, the suit is still essential with certain clients – often the elderly and conventional – however, it is not popular everywhere. “We’re working with many technology businesses, in the movie industry or in the arts. Some of these clients tell us to come in our casual wear” says Thomas McComber. An essential trend that all firms are not ready to adopt yet. At least not right now. The Richter firm still has a dress code. “It’s not a rule but we want to ensure that outfits are professional when we meet with clients”, indicates Mindy Mayman, Partner in Richter. Like in many firms, the obligation to wear a tie has already been abandoned but the usual blazer-shirt-trousers for men and suit for women are still prevailing. Except on Fridays, where jeans – without holes – are allowed. “We still expect our collaborators to wear conventional outfits. Some clients have expectations on this matter, affirms Mindy Mayman who doesn’t consider giving up on basic clothing guidelines but remains opened to change if a general trend becomes a reality. Members of Chartered Professional Accountants left it to firms to comment on the subject. “For now, it hasn’t caused any tension with employees. When we welcome the younger generation of employees to our firm, this conventional dress code will help them adopt the right tone towards clients. It encourages them to pay attention to the way they sit, the way they speak. They know they’re not wearing a pair of jeans, talking to their friends on a couch like they do on the weekends,” continues the partner. Young people who, generally arrive already dressed according to the most classic standards, perfectly are aware of the tacit rules of this environment. APRIL 30, 2016, Montreal — Lacharité McComber Kuczynski (LMKCA) today announced that the Montreal firm has been accepted as the newest member of BHD, an association of independent mid-sized accounting and consulting firms with representation in major cities across Canada. As the sole Montreal member firm of BHD, LMKCA strongly enhances its ability to deliver assistance, referrals and specialized knowledge to clients with national or international business needs. Montreal, January 22nd, 2015- Lacharité McComber Kuczynski, an independent firm of chartered professional accountants, has announced it is partnering with Sage North America, a leading provider of business management software and services to small and midsized businesses in Canada for more than 30 years; Oriso Solutions Inc., a company specializing in application delivery in the cloud since 2006; and the Institute of Professional Bookkeepers of Canada (IPBC), Canada’s largest bookkeeping association, to offer a unique cloud-based bookkeeping service to Canadian businesses with annual revenues up to $5 million. The service will consist of a full or partial outsourcing of businesses’ bookkeeping tasks to IPBC Certified Professional Bookkeepers that will use Sage 50 Premium Accounting–Canadian Edition or Sage One–Canadian Edition to record their clients’ transactions. Sage 50 will be hosted on a secure cloud platform in state-of-the-art Canadian data centres, eliminating the need for the firm or their clients to install software locally. Sage One is a cloud-based accounting solution and also requires no software installation. “Many smaller organizations are looking for a solution to help them file supporting financial documents, monitor their accounts receivable, accounts payable, work in progress, payroll and inventory accounts, and provide timely financial statements. These businesses typically do not have the financial resources to hire a full-time accountant, and therefore need a cost effective way to outsource this function. We have lined up our favorite accounting software, cloud computing partner along with Certified Professional Bookkeepers across Canada to fulfill what we like to call Cloudkeeping,” says Geneviève Lacharité, CPA, CA, co-managing partner of the firm. “Certified Professional Bookkeepers will provide the entrepreneur the expertise needed to assure their bookkeeping and internal controls are at the desired levels needed to have accurate financial information they will need to run their business. Certified members from the IPBC, must pass a national certification exam, follow a code of conduct and are required to maintain a high level of continuing education credits to keep their designation,” says Louie Prosperi, Chief Executive Officer of the IPBC. “Partnering up with Lacharité McComber Kuczynski is a perfect fit. Both of our organizations’ goals are in line in providing the small business owner the highest level of financial expertise and service they need to be successful”. Based in Montreal, Lacharité McComber Kuczynski is an independent firm of chartered professional accountants, which offers its corporate clients highly specialized expertise in the areas of assurance, accounting, tax and business advice. Please visit www.lmkca.com for complimentary information. For the first time, the Ambassadors Gala was the backdrop for the CPA Awards of Excellence presented to seven men and women who enhance the visibility of the profession and stand out for their leadership, dynamism and community involvement. “These exceptional professionals, who have distinguished themselves through their significant achievements, embody the values that go hand in hand with the CPA designation, and are true ambassadors of the accounting profession in Quebec,” said Alain Dugal, FCPA, CA, chair of the Order. Spotlight on Excellence at the Ambassadors Gala of the Quebec CPA Order - Download the press release of the Ordre des comptables professionnels agréées du Québec here. Lacharité McComber Kuczynski, a rapidly expanding accounting firm located in the heart of Montreal’s Old Port, is looking for a leading partner to fulfill the role of Audit Manager within the organization. Candidates should hold the CPA, CA title and have at least five years of experience within a department of auditing. For further information, consult www.lmkca.com or send your application to: job@lmkca.com. Congratulations to the recipients of the CPA Awards of Excellence! dynamism and community involvement, the CPA Awards of Excellence were presented to seven exceptional members. The recipients are: Thomas McComber, CPA Award of Excellence - Public practice, Julie Chaurette, CPA Award of Excellence - Community service, Nicolas Boivin, CPA Award of Excellence – Education (ex-aequo), Michel Vézina, CPA Award of Excellence – Education (ex-aequo), Alexandra Genest, CPA Award of Excellence – Young professional, Benoit Caron, CPA Award of Excellence – Public sector (ex-aequo), Michel Samson, CPA Award of Excellence – Public sector (ex-aequo). Newspaper Article – Lacharité McComber Kuczynski inc. The associate co-directors of Lacharité McComber Kuczynski inc., Thomas McComber and Geneviève Choinière-Lacharité. Choosing a good accountant is a bit like finding the right doctor. Once you found one, you won’t let it go. The philosophy of the Lacharité McComber Kuczynski inc. firm is based on providing services to entrepreneurs and this motto definitely contributes to the its success as one of the most acclaimed actor on the Montreal market. General and tax accounting are a leading edge, constantly evolving field. The legal environment changes from one year to the next and, if not properly managed, can bring disaster even to healthy companies. This should convince even the most reluctant to do business with true professionals. Bringing together four associates, the Lacharité McComber Kuczynski inc. firm does not merely provide services to its clients. It proposes nothing less than a true partnership reaching far beyond bookkeeping and audit and assurance mandates. “We work in a sensitive and demanding field that constitutes a challenge for each of our team members on a daily basis. The slightest mistake can result in significant complications and we assume our responsibilities in a professional way, since our main driving force is our passion”, explains Geneviève Lacharité, associate co-director of the firm. The services offered by the firm are tailored for the increasing needs of businesses and the subtleties of current legislation. “We have developed an offer of services that allows us to deal with all accounting and tax issues our clients are facing, and this is a real partnership for them”, says Thomas McComber, associate co-director of the firm. The merger of the Gilbert Masson, CPA, Gestion Corporative St-Paul inc., and Lacharité McComber Kuczynski S.E.N.C.R.L. accounting firms was recently announced: “Through this considerable increase in the number of professionals working in our firm, we also increase directly the expertise, availability, experiences, opinions, and business perspectives that can be offered to our clients” mentions Rafal Kuczynski, associate co-founder. Accounting: Guidance of the accounting department and reporting to the management; Preparation of memoranda on technical subjects; File preparation for audit and assurance mandates; Bookkeeping, payroll, sales tax rebates, and deductions; Staff support and training in accounting. Tax accounting: Preparation of corporate, personal, and trust income tax reports; Corporate and personal tax planning; Research and development (R&D) credits; Business transfer and estate freeze. Business advice: Advice for start-ups; Due diligence audits (buying/selling businesses); Preparation and review of business plans; Preparation and review of budgets and financial forecasts; Cost assessment and selling price of products and services; Assessment of returns on investment projects; Restructuring, mergers, liquidation, and acquisitions. Geneviève Choinière-Lacharité, CPA CA has worked for ten years in a nationwide accounting firm before founding Lacharité McComber Kuczynski. After graduating from HEC with a citation of excellence, she has pursued her career with the same rigour and constant striving for excellence, thus becoming a committed and discerning professional who can often shed a new light on issues and suggest high added value solutions to her clients. Mrs Lacharité is also a laureate of the CPA Émergence 2012 Prize. Thomas McComber, CPA, CA: Since the beginning of his career in October 2001, Mr McComber has developed considerable expertise working with an important entrepreneurial clientele in a vast array of business sectors, including professional services, entertainment, new technologies, import-export, and distribution. He has always been passionate about entrepreneurship and business development. He co-leads the firm with Mrs Lacharité, with the core mandate to establish Lacharité McComber Kuczynski as the leading boutique accounting firm in Quebec. Rafal Kuczynski, CPA, CA: has over twelve years of experience in accounting, audit and assurance, tax accounting, and business advice to SMEs and non-profit organizations. He is a laureate of the Prix Relève d’Excellence 2013 – Consulting Services, and is actively involved as administrator and Board member of the Chambre de Commerce de l’Est de Montréal, and as treasurer and Board member of the Maison des Enfants de l’Île de Montréal. Gilbert Masson, CPA, CA: With over 35 years of experience, Mr Gilbert Masson is greatly appreciated by business owners due to his in-depth knowledge in the field of accounting and business in general. A founder and administrator of the chartered accountant firm Cabinet de Gilbert Masson, CPA et Gestion Corporative St-Paul inc., he is characterized by his strong understanding of challenges faced by entrepreneurs. His collaborative approach has proved invaluable in helping clients achieve their full potential as entrepreneurs, while at the same time reducing their income tax payments and protecting their assets. Mr Masson has always been on the side of success-oriented entrepreneurs. Lacharité McComber Kuczynski, Cabinet de Gilbert Masson CPA, and Gestion Corporative St-Paul, three independent accounting firms in Montreal, have announced a merger under the name Lacharité McComber Kuczynski inc. The merger took effect on September 24, 2013 and created a boutique accounting firm gathering four partners and twenty professionals. Lacharité McComber Kuczynski inc offers a full range of professional services to assist businesses in their development, in addition to regular accounting and assurance services. By merging with Gilbert Masson’s firms, members of Groupe Servicas, one of the largest networks of independent accounting firms in Quebec, Lacharité McComber Kuczynski inc. significantly increases its professional network. Lacharité McComber Kuczynski LLP, Cabinet de Gilbert Masson CPA and Gestion Corporative St-Paul Inc., three independent firms of chartered professional accountants in Montreal, have announced a merger creating Lacharité McComber Kuczynski Inc.The merger will create a boutique accounting firm gathering four partners and twenty professionals, taking effect on September 23, 2013. Lacharité McComber Kuczynski Inc. (www.lmkca.com) will offer a full range of professional services to assist businesses in their development, in addition to regular accounting and assurance services. By merging with Gilbert Masson’s firms, members of Groupe Servicas, one of the largest networks of independent accounting firms in Quebec, Lacharité McComber Kuczynski Inc. significantly increases its professional network. For the Lacharité McComber Kuczynski professional chartered accounting firm (LMK), a SME in the accounting sector, the attraction and retention of skilled staff has become a major challenge. Founded in 2010, LMK employs ten people and offers various financial statements audit and assurance, tax accounting, and bookkeeping services to entrepreneurs. Successful candidates should not only be passionate and motivated by their profession, but also hold a basic diploma (e.g. a Bachelor of Accounting) and be in the process of obtaining their chartered accountant designation. For the directors of LMK, not having graduated yet or holding a foreign diploma is not an obstacle to employment. Most important is the will to persevere in the area and to stay as long as possible in the firm. In this context, the immigrant workforce is a precious asset. Many of them are skilled and motivated candidates for whom professional experience acquired in Québec is highly valuable. For LMK, the help and support of organizations that bring closer businesses and job seekers are most relevant. They save time and money during the selection and recruitment of potential candidates with an immigrant background, particularly in crucial periods for the firm. 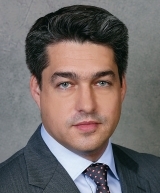 “We resorted for the first time to the Board of Trade’s Interconnexion program in order to fill quickly vacancies at the end of the fiscal year, a busy period in our domain”, says Mr Rafal Kuczynski, a LMK associate. “When we realized that the Interconnexion program not only preselected candidates and organized meetings between them and employers, but also allowed us to welcome them for four-week trial internships, we immediately adopted it”, adds Mr Kuczynski. For the three associates of the firm, those internships respond to the businesses’ needs, and provide candidates with meaningful experience and references in their domain. It’s a win-win deal. Mr Rafal Kuczynski is a laureate of the Prix Relève d’Excellence 2013. This award is attributed by Réseau HEC Montréal to alumni under 35 years old in recognition of their professional achievements in the following categories: Large Company, Small and Medium-Sized Business, Entrepreneur, and Accounting and Professional Orders. Our associate Geneviève Lacharité has been awarded the CA Émergence 2012 Prize. This distinction highlights the determination, dynamism, and contribution of young CPA professionals who distinguished themselves by their achievements or through tackling challenges at the professional or community level. 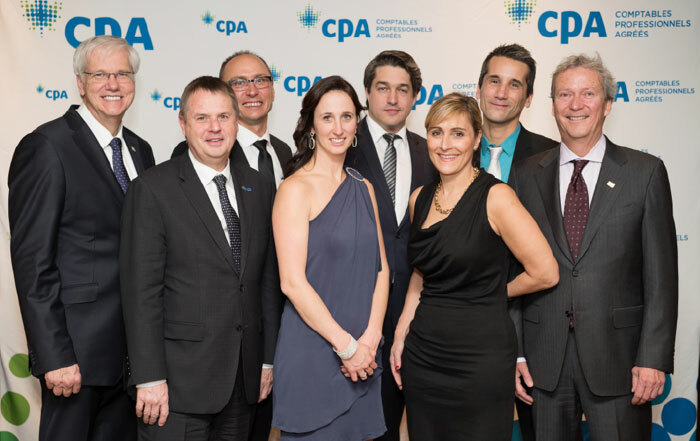 Last December, the Montreal CPA Group proudly awarded the CPA Émergence 2012 Prize to Geneviève Choinière-Lacharité, CPA, CA. This young professional, who had an impressive career debut in a nationwide accounting firm, is a chartered accountant since 2004. With her varied expertise background, particularly in audit and assurance, accounting, and financial reporting, Geneviève truly has an entrepreneurial spirit. In 2009, she founded her own firm, Lacharité Services Conseils inc., offering various audit and assurance, financial consulting, and tax accounting services aimed specifically at start-ups and SMEs. Thanks to her business acumen and determination, the firm has experienced remarkable growth within a mere ten months. Two new associates joined her in 2010, creating the Lacharité McComber Kuczynski accounting firm. Geneviève stands out as an “entrepreneur serving entrepreneurs” who is committed to supporting individuals wishing to start their business, providing them with the tools they need, and raising their awareness of the importance of financial reporting. Moreover, she is actively involved in the Info Entrepreneurs program of the Board of Trade of Metropolitan Montreal. Well-known for her determination and daring, Geneviève distinguishes herself with her innovative ideas and her constant pursuit of excellence in performing her duties. Her professional qualities make her an outstanding CPA. Lacharité McComber Kuczynski joins the Montreal CPA Group to offer their warmest congratulations to Geneviève Choinière-Lacharité, laureate of the CA Émergence 2012 Prize. Geneviève proved to be a gifted and dedicated professional who has a passion for her work and is a constant source of inspiration for us. This promising businesswoman stands out for her leadership and positive, innovative insights in the future of our profession.